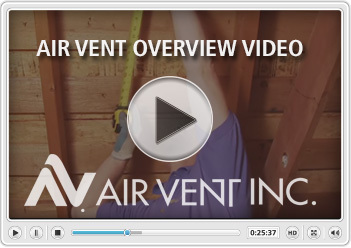 A complete line of ventilation products that meet the highest standards for quality and performance. 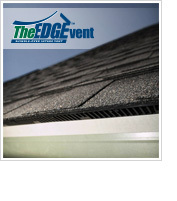 - Air Vent, Inc.
Air Vent’s Intake Vent: The Edge™ Vent provides proper intake ventilation for homes with little or no overhang. It’s a roof-top installed, shingle-over intake vent designed based on roofing contractor feedback from our Ask the Expert™ seminars. It can be used to supplement existing soffit or undereave vents as well. The vent provides 9 square inches of net free area per linear foot. Q. How will The Edge Vent perform in snow and ice regions of the country? A. In terms of structural integrity, The Edge Vent will perform similarly to Air Vent’s ShingleVent® II ridge vent, which is the same exact copolymer resin material as The Edge Vent. Q. What are the benefits of installing a power vent with a thermostat/humidistat? A. With combination thermostat/humidistat controls, power attic ventilators monitor heat and humidity levels in summer through winter for year-round attic protection from the damaging effects of moisture and heat buildup.